The Cayman Island weather is what you would expect from this beautiful chain of Caribbean islands. 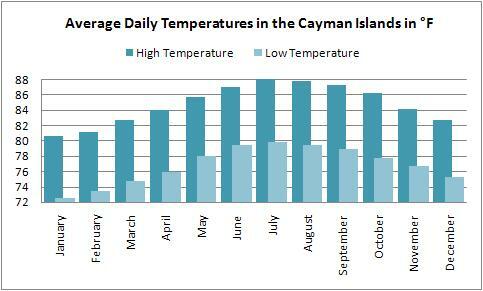 The weather in the Cayman Islands sees temperatures with an average high temperature between 80°F (26.7°C) and 88°F (31°C) and average low temperature between 72°F (22.2°C) and 80°F (26.7°C). You should probably take a light sweater, rain resistant windbreaker or long sleeved shirt for evening wear, as well as long pants, which would be appropriate in the conservative society away from the beach. The driest months are in the moderately cooler months of March and April (see the chart at the bottom of the page). The water temperature during this time will be around 78°F (25.67°C) to 82°F (27.8°C). This is cool enough for some people to become chilled, so be prepared to wear a wet suit if necessary if you plan on snorkeling or scuba diving. Of course, the dry season shouldn't be expected to be completely rain free, however, and will have the occasional light shower. The wet season runs from May through November, and is generally warmer than the dry season. As a result a sweater may be a bit warm (and end up being rain soaked if you are caught unexpectedly in a shower), so don't forget the rain resistant wind breaker since umbrellas may not do well in Caribbean islands winds. Water temperatures during this season are warmer as well, running between 82°F (27.8°C) to 86°F (30°C) on average. During rainy season, anywhere between 16% of the days (May) and 24% of the days (August) will see rain. Average annual rainfall is around 46 inches. The Cayman Islands do have a higher statistically likelihood of being affected by a hurricane than their neighboring islands, with significant effects from a hurricane every couple of years or so, and a direct hit about every nine years. Distant hurricanes can still have a wide range of effects, however, ranging from larger storms to refreshing breezes. This may also prove a good time for beach combing. If you are fairly flexible and plan ahead, the Cayman Island weather should not be a problem for most people, and will likely prove quite pleasant. As long as you are not particularly sensitive to the heat and humidity or to frequent light showers in the rainy season, the Cayman Islands make an ideal Caribbean islands vacation destination. Check out the Grand Cayman Wanderer for information on the many beautiful Grand Cayman beaches where you can enjoy the Cayman Island weather.